Elder Grant's last Sunday in Abitibi Branch. Elder Smith on the right. Well, I guess my resolution to post more often was in vain. It's been awhile since we last posted anything. Life gets hectic here just as it did at home, but I still haven't figured out where the time goes. 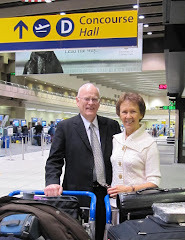 We enjoyed General Conference, it was great as always. We went to the chapel to watch it. We had two computers set up, in different rooms. One was set for English and one for French. There were between 7 and 10 people present, depending on the session. Two to four of them were investigators. The other members watched it on their own computers at home. Before we left Calgary we bought a DVD on conversational English called "Daily Dose". We thought it might be useful in India. It was only instructional and didn't include the posters that would make it really effective. But we figured if we did need it we'd see if the mission could get the posters for us. We didn't want to take anything with us we might not need, especially the extra weight. When we started planning for an English class here, low and behold!, the Elders excitedly informed us that the posters were at the church but the training DVD was nowhere to be found. Coincidence? I think not. The Lord knows what is needed in every corner of His vineyard, even when we don't have a clue. The mission president asked that we teach the Addiction Recovery Program since this area has such a need. Those we are teaching are very positive about the strength that comes from the application of scriptures and writing down personal thoughts in the questions at the end of each step. This program gives determination to overcome addictions permanently. We love the people as they have great attitudes. When they find it tough they turn to the Lord and the scriptures and find real strength to endure. This is the first time we've had to deal with transfers, and it's tough! Thank goodness we don't have to worry about being split. But we are losing Elder Grant. We knew it had to happen eventually. We've come to love Elders Smith and Grant like family. They have strong testimonies of the gospel. They are enthusiastic, hard working and always positive. And they are funny. They've also been sooo patient with us as they've tried to teach us French. We have appreciated their good examples. 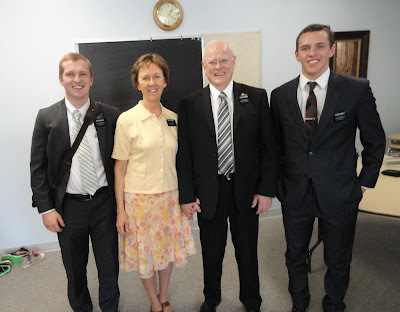 We will miss Elder Grant but we know the Lord needs him somewhere else now. Elder Messinger will replace him. I'm sure we'll love him too. The Elders have taught four English classes to date. We will be teaching our first lesson tonight, since the Elders are leaving to take Elder Grant to Ottawa for transfers tomorrow. We generally supply the snack and give support and friendshipping. We've gone from one student to five, two of whom are practicing Muslims. We love them all. They're lots of fun and are having a great time learning. The Elders are now using the English Learning posters and sticky notes to replace the English words with French ones for our French lessons. It's a very effective and practical way to learn another language and only takes about 20 minutes a lesson. They're still giving us some grammar lessons as well, which I appreciate. My vocabulary is becoming quite extensive. But using what I've learned is another story. I freeze whenever anyone says anything to me in French. It's not until the opportunity has passed that I remember what I could have said. And I'm very self conscious about using what I do remember, even when speaking to the Elders. Most of what I've learned I don't really know how to apply anyway. I did decide to take the bull by the horns, however, and bear my testimony on Sunday en Francais. (We had Fast and Testimony Mtg.this past Sun. as Stake Conference is next weekend.) I spent all day Saturday studying seven sentences and listening to Google Translate say them for me. I was very slow but I managed to remember everything. I was told I did well and that my accent was almost perfect so maybe I will be a little braver in the future. I really am enjoying learning French and am determined to be able to at least get by, by the time I get home. Dad says he's doing great with his French. He may even be able to speak baby talk by the time we get home. I guess language is not his strong suit. He does much better with hands-on learning, like mechanical and electrical. I think his inability to hear certain sounds makes it more difficult for him to learn the language. That's OK though. Once I learn, I can do the talking for both of us. We all know how much I can talk. Last week the men decided they should have a Men's Night Out / FHE each Monday night. There are some men who don't have families in this area. They asked my permission for Ron to join them. We have our own FHE earlier when we study and go out together for preparation day activities. Dad and I made up a Mousy Mousy game. (That was our activity.) All the guys brought snacks. Dad made cinnamon/sugar popcorn. They held it at the church from 7 to 8:30. After the lesson they played Mousy Mousy. It was a big hit. So much so that this week they chose to play it again. Men's night FHE favorite activity. On Friday I drove out to Rouyn-Noranda to meet with Monica, the sister from Cardston. I wanted to go to the second hand store and also to any shoe stores I could find. We only have one each in Val d'Or. We spent three hours shopping and then three hours visiting teaching. The Relief Society President came visiting teaching with us. It was a great opportunity for me to get to know the sisters in Rouyn. We tried to go for Chinese food after our visits but something had knocked out the electricity on that side of the street, so we went across the street for pizza instead. It was nice to spend some time with just women. I left the house at 8:45 am and didn't get back until 10:30 pm. I think we're going to do it again next month. Good thing senior missionaries don't have to spend 24/7 together like the Elders do. Elder Rhodes would not survive the shopping. The Elders provided dessert for supper. A delicious angel food volcano of whipped cream and raspberries drissled with chocolate syrup. A couple of clowns in our kitchen. 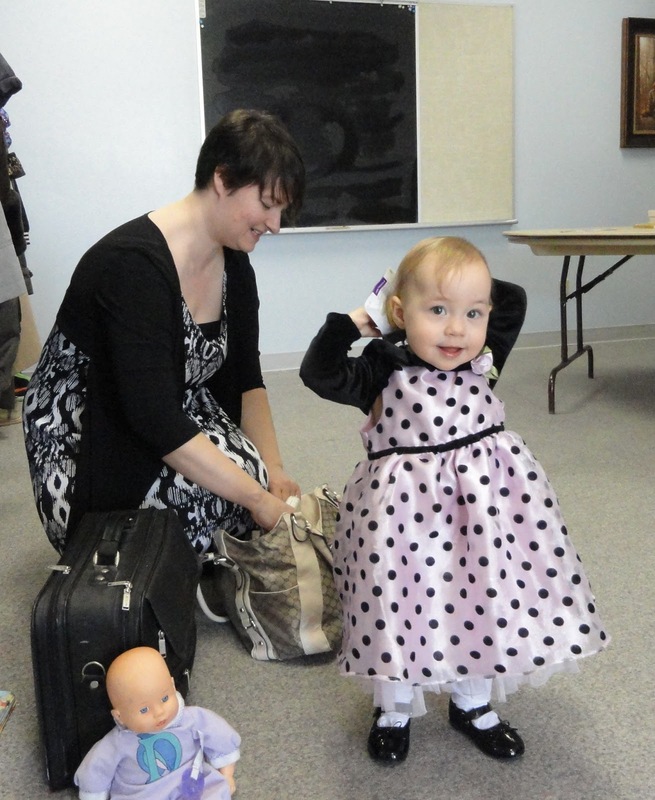 This little cutie had everyone laughing with her antics in sacrament mtg. Mom is the Primary teacher. Bro. and Sis. Gee drove the 5 1/2 hrs. from Ottawa with the Branch Pres. just to support the Branch. These three girls come to church without their parents. Only the one on the left is a member. The man in the chair is waiting patiently for his ride back to Rouyn-Noranda. His ride, Sister Roy, is in a R.S. Presidency meeting.